Titled Moore Blues For Gary, the collection was put together by Bob Daisley who invited a range of artists to rework a selection of Moore classics. The 13-track record will launch on October 26 via earMUSIC. Bassist and producer Daisley says: “In my opinion, Gary was one of the best guitarists who ever lived. It was an honour for me to have worked with him and to have known him so well. “When Gary passed away in 2011, the world lost one of the all-time greats. I don’t think that enough was said or done at the time to acknowledge the loss of such a great player, so I took it upon myself to pay personal tribute to the man and record some new versions of his music, mostly from his blues catalogue. “I asked many members of the Gary Moore family tree, and some other great players, to contribute to the project. The response was not only encouraging, but very moving. 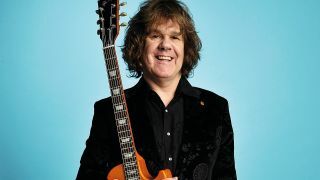 It seems that the name Gary Moore is also synonymous with the words ‘respect’, ‘honour’ and ‘greatness’. “I didn’t set out to recreate anything that Gary had done, or to compete in any way. These arrangements and performances represent a ‘hats off’ to Gary and nothing more.